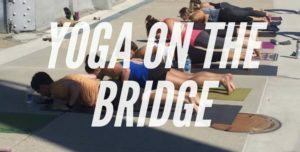 Every Sunday meet on the bridge at 10am to join in a low cost yoga practice. No experience necessary, all abilities welcome. Classes will continue into Fall for as long as weather is permitting. Class is a $5 suggested donation with all funds going to support Roots2Rise classes in Philadelphia Parks and Rec. Facilities throughout the city. Check our Facebook page for weather related updates!